32 years. That's how long it took me to make the plunge into a CAP mess dress uniform. It also took me 22 years of service before I finally set up my military mess dress, so I guess I'm a late bloomer. I wore my CAP mess dress for the first time last night, but I had to wear my military medals because my order from Vanguard hasn't come in yet with my CAP medals (by the way, it was almost 200 bones for those little boogers). I got my military medals set up through UltraThin and they're great, but I don't feel like dropping another $100 to send my CAP medals to UltraThin to have them done up right. Then I saw some of the people with CAP medals and they looked pretty bad. Any tips on putting CAP medals together and making them look good? Also, which badges do you wear? I saw people wearing mini badges and full size. I wore mini CAP observer wings and jump wings, but I just couldn't see any kind of consistency at the event last night. Lastly, the huge 400 lbs. Civil Air Patrol hockey puck that we wear. Mine was flat, but a couple of people had a beveled version that I thought looked better. Here's a pic I found on MIWG's site where you can sort of tell the difference between the two types of CAP seals. Left is flat, right is beveled. I want a beveled one. Any other tips to CAP mess dress? If you're crafty remounting mini medals isnt overly difficult. You can remove the medals from their original mounting bars and mount them to a piece of flexible plastic such as pieces cut from a milk carton fairly easily. Layout the medals in the manner you wish to wear them, trace a template, put the template on the plastic and trim the plastic as necessary. You'll have to do each row individually. Once the plastic is trimmed to size, carefully slide the plastic inside the front layer of the medal drape, adjust the medals as necessary to make them hang properly and use double sided tape to adhere first the rear layer of the drape and then the front to the plastic. Trim a stiffer piece of plastic to the rough dimensions of a mini-medal holder for your number of medals and push single ribbon holder bars, the flat type, through the front as necessary to support the medals. Take each row of medals, starting from the bottom, and attach them to the backer plastic using superglue. This sandwiches those single ribbon bars I mentioned between the medal mount and the backer. Voila, mounted medals! I do reccomend practicing this a few times if you have any spare medals. I used to make a nice chunk of pocket money around Marine Corps ball season mounting Marines' medals for them. People will notice how nice your medals look and ask where you had them done. The Air Force "custom" is to wear the mini wings and badges on Mess Dress, especially if you have two or more rows of medals. You do have the option of wearing either the embroidered bullion wings, badges and CAP Seal or the metal ones. But it's all metal or all bullion, no mix and match. I got a new CAP Seal from Vanguard about four years ago and it was the "beveled" design. Fun fact: The seal is the same one they use on award plaques, they just add a couple single ribbon ribbon bars to the back with double sided foam tape so you can pin it to the jacket. For the medals I just mount them on the metal mini medal racks you can get at clothing sales (which are from Vanguard). I have seven rows so I use a 3 and a 4 row rack. Seems to work pretty good for me. As for which medals I wear, I wear all of my CAP medals plus my Air Force individual awards, i.e. 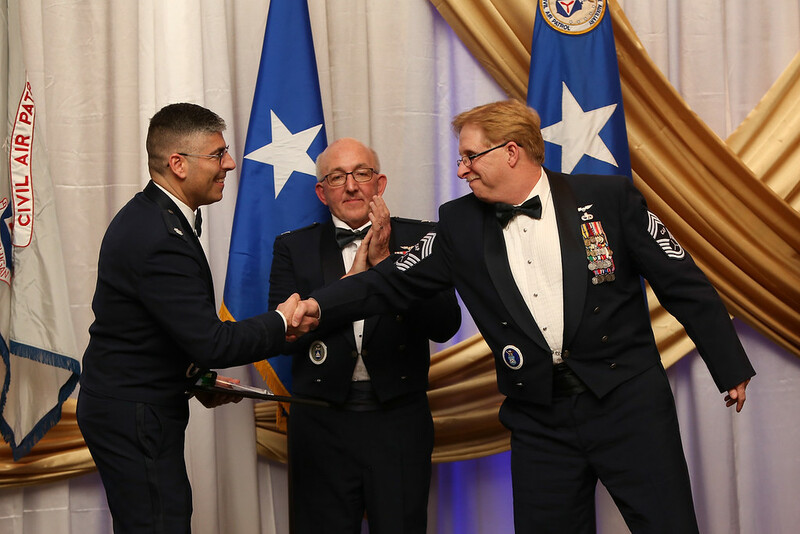 Meritorious Service Medal, Air Force Commendation Medal, Air Force Achievement Medal and Aerial Achievement Medal. And I only wear devices on the top row since they're the only one's that can be seen. I have a jacket and trousers I got off eBay (just had to remove the chief stripes) but haven’t gotten around to having new stripes put on it or getting the tie, cummerbund, shirt, or medals. I do have a crest that’s been sitting in a box for a couple of years. Maybe by the time I’m a SNCO I’ll complete it. That's the way I brought my Mess Dress. One piece at a time. Seems to hurt less if you spread it out over time. I got my Air Force mess dress from the Andrews AFB thrift shop for free (the uniform part of the Andrews thrift shop is free). I only had to buy the white shirt and my medals. For CAP, I went ahead and dropped the cash for the mess dress coat and obviously the bling. Yeah, I learned the hard expensive way that you can't see any of the devices on any row except the top. Good call. 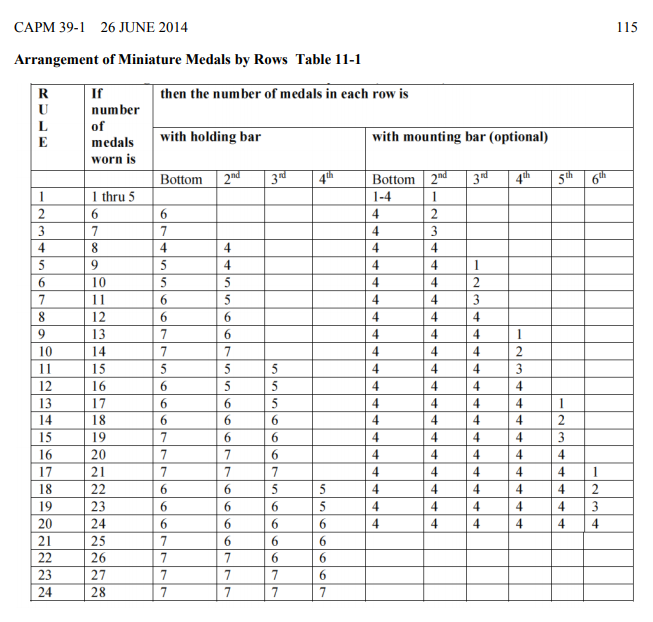 Once my mini-medals show up, I'll buy an appropriate rack from the Wright-Patt's MCCS and get started. I have an event to wear my mess dress again to in April. Okay....first rule of the Mess Dress is.....throw away the ruler. it won't help and will only drive you crazy. As for the CAP Badge.....some people remove the button that it is supposed to cover. That way the flat one fits nicely. The dome one was designed to cover the button. So....if you don't plan on using the mess dress for USAF functions.....just take off the button. There is no real secret to the mini medals....unless you plan to wear ALL of your USAF and CAP medals....and your like me they don't make 27 row medal rack......is that I have my USAF stack and then then I have my CAP stack which I put on a rack that has a lone ribbon rack on top. I use this one to gauge the distance between the two ribbon racks. As for getting them to look right.....the only thing you can do is stick them on and look in a mirror or have some one else look at them for you. make adjustments and the repeat until they look "right". Every body has a different body shape....so there is no hard and fast rule on where exactly everything goes. So....if you don't plan on using the mess dress for USAF functions.....just take off the button. Officers nor enlisted can share the mess dress coat between AF and CAP. Unless you plan on removing rank (enlisted) or the silver/blue braid n the sleeve (officers). That said, I quickly removed the button when I saw how sloppy it looked placing the CAP frisbee over the button. I have no plans to combine my military and CAP medals. That would literally be 9 rows total and would look awful, especially since CAP has almost all ribbons equal medals. Fun fact. I dropped my mess dress off at the cleaners on base to get dry cleaned, and I let them know that I purposely removed the button. I had to sign a note stating that I will not hold them accountable for that missing button when I pick up my dry cleaning. Can't wrap my noggin' around this. Photos? Same here. They're a bit paranoid about stuff like this. NIN, I'll grab photos of my medals when I get them from storage for the wing/region conference. I'm also doing a set of thin ribbons up at the moment. I'll take photos of those as I work on them so everyone can get a general idea how it's done. Its too bad I'm going to the same conference as Stonewall, its on the same weekend as NER. You're right, 24 is the maximum number of medals using the commercial mounting bars. The manual allows up to 28 medals if you use "holding bars" with 7 overlapping medals per bar. Regarding attachments, (shameless plug) the McChord.org Rack Builder does a pretty good job of displaying attachments on mini-medals.